#C0008. Black high hat; baldric; adult sized diaper. Rental Item. $34.50 each. #H1510C. Purple, green and gold velveteen tunic with bells; black breeches; shoe covers with bells; velvet cord tie; matching hat with bells; tights. Rental Item. $79.50 each. #B5170. Jester’s bauble. Rental Item. $14.50 each. #E2120. Green high hat or derby; shirt; lace jabot; showy vest; green tail coat with velvet collar; matching breeches; tights or stockings; large shoe buckles. Rental Item. $84.50 each. #S5219. Shillelagh. Rental Item. $10.50 each. #E2110. White mob cap with green ribbon; peasant blouse, green basque and green skirt or green peasant dress; half apron; shoe buckles. Optional petticoat. Rental Item. $64.50 each. #A2160. White cloth open faced hood; white faux fur body suit with large tail; paws. Rental Item. $84.50 each. #A2180. Full, oversized, white hard head; white faux fur body suit with large tail; paws. Rental Item. $99.50 each. Please note that photo shows head only. #A2184. 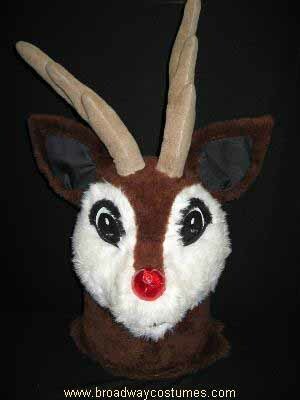 Oversized, faux fur covered head; faux fur body suit; mitts or gloves; tail; shoe covers. Rental Item. $84.50 each. Please note that photo shows head only. #A2186. Oversized, faux fur covered head with sequin bonnet; faux fur body suit; mitts or gloves; tail; shoe covers. Rental Item. $84.50 each. Please note that photo shows head only. #A2162. 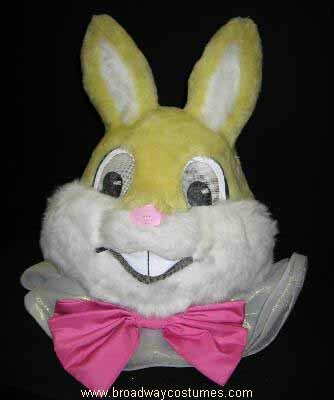 Pink cloth open faced hood; pink faux fur body suit with large tail; paws. Rental Item. $84.50 each. #A2182. 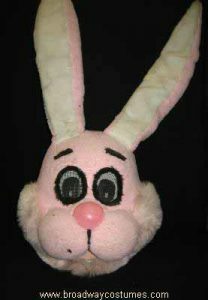 Full, oversized, pink hard head; pink faux fur body suit with large tail; paws. Rental Item. $99.50 each. Please note that photo shows head only. #A2200. In white faux fur. 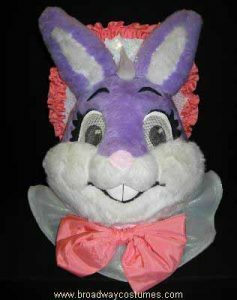 Cheerful, full, oversized, hard head; body suit; paws; large padded feet; oversized powder puff tail; huge padded pastel bow tie; brightly colored vest; special contour body padding which produces a little pot belly. Rental Item. $99.50 each. #H2260. White cloth open faced hood, tail and paws; Georgian man’s ensemble (lace jabot, shirt, high buttoning velvet or brocade waistcoat, coat, coordinated or matching breeches, tights or hose and shoe buckles). Rental Item. $120.50 each. #A2280. 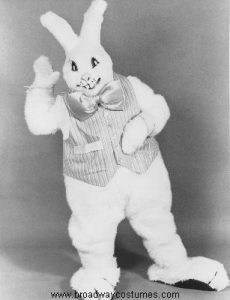 Full, oversized, white hard head, tail and paws; Georgian man’s ensemble (lace jabot, shirt, high buttoning velvet or brocade waistcoat, coat, coordinated or matching breeches, tights or hose and shoe buckles). Rental Item. $140.50 each. Please note that photo shows head only. #H2261. White cloth open faced hood, tail and paws; Georgian woman’s ensemble (ankle-length one- to four-piece ensemble, petticoat and shoe buckles). Rental Item. $120.50 each. #H2281. Full, oversized, white hard head, tail and paws; Georgian woman’s ensemble (ankle-length one- to four-piece ensemble, petticoat and shoe buckles). Rental Item. $140.50 each. #A2290. Brown faux fur hood with attached ears; matching body suit with spats; mitts; tail. Rental Item. $84.50 each. #C0002. Hair bow; white little girl-style dress with red and blue trim; white hose or tights. Rental Item. $64.50 each. #C0004. White shirt; red and/or blue bow tie; blue or red vest with stars, or red and white striped vest; red and white striped trousers or shorts. Rental Item. $64.50 each. #C0006. Blue pill box with stars; blue short sleeved blouse; red and white striped tap pants. Rental Item. $64.50 each. #C0400. Red, white and blue top hat; vested shirt front or shirt; sparkling bow tie; blue tail coat with red lapels; dance trunks; white gloves. Rental Item. $84.50 each. #C0940. Pointed silver headdress; white floor-length gown with drape; torch; cord tie. Rental Item. $54.50 each. #C0941. 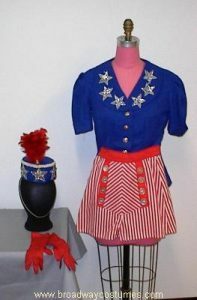 Blue pill box hat with silver stars; blue short sleeved blouse with stars on lapels; red and white tap shorts; white gloves. Rental Item. $54.50 each. #C1060. Striped top hat; white shirt; red, blue, or striped red and blue vest; bow tie or jabot; blue tail coat with wide lapels; red and white striped trousers; gloves. Rental Item. $84.50 each. #H1900A. Standard. 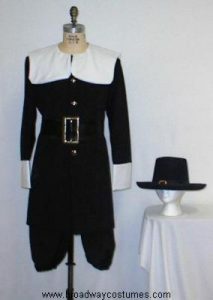 Tapered Puritan hat (wide brim and front buckle); jacket with white collar and cuffs, or jacket and shirt; dark breeches; dark hose or tights; shoe buckles. Rental Item. $84.50 each. #H1900B. Budget. 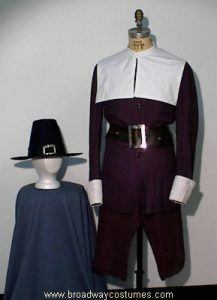 Tapered Puritan hat (wide brim and front buckle); poly-knit jacket with built-in collar and cuffs; breeches; belt; hose or tights; shoe buckles. Rental Item. $64.50 each. #H1940. 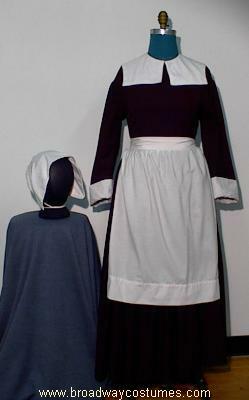 White or colored bonnet with ribbon ties; black, gray, brown, purple or other dark colored ankle-length dress with white collar and cuffs; white apron; petticoat. Rental Item. $84.50 each. #E4950. Headband with bright feathers; leather-like or cloth Native American vest, shirt or tunic; fringed trousers or trousers and leggings; loin cloth; beaded necklace. $54.50 each. #E4955A. 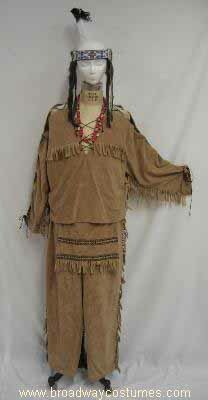 Full feathered Native American war bonnet; decorated and/or fringed Native American tunic; trousers; beaded necklace. Optional loin cloth. Rental Item. $84.50 each. #E4955B. Full feathered Native American war bonnet and trailer; decorated and/or fringed Native American tunic; trousers; beaded necklace. Optional loin cloth. Rental Item. $120.50 each. #E4960. Headband with colorful feather; fringed leather-like or cloth midi- or mini- length, trimmed dress; beaded necklace. $54.50 each. #B5490. Bone breastplate. Rental Item. $25.50 each. #F5320. Moccasins. Rental Item. $12.50 per pair. #H6820. Headband. Rental Item.$6.50 each. #H6830. War bonnet. Rental Item. $27.50 each. #H6840. War bonnet with trailer. $53.50 each. #L5030. Cloth loin cloth. Rental Item. $10.50 each. #T5108. Novelty tomahawk. Rental Item. $4.50 each. Please remember to supply boot size when ordering boots or costumes containing boots. #C0720. In plush: Hat; coat; belt; trousers; boot tops; white gloves. Wig and beard not included. Rental Item. $75.50 each. #C0740. In velvet: Hat; coat; belt; trousers; boot tops; white gloves. 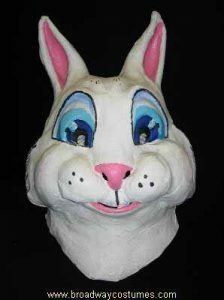 Wig and beard not included. Rental Item. $100.50 each. #C0780. In plush: Hat; coat; belt; trousers; boot tops; white gloves; synthetic hair wig and beard set. Rental Item. $100.50 each. #C0800. In velvet: Hat; coat; belt; trousers; boot tops; white gloves; synthetic hair wig and beard set. Rental Item. $125.50 each. #B5078. 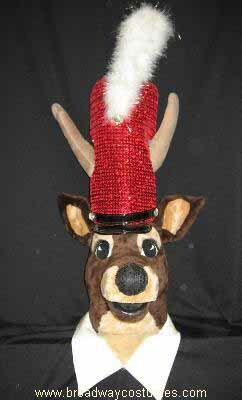 Velvet toy bag. Rental Item. $14.50 each. #B508 0. Toy bag. Rental Item. $6.50 each. #B5190. Hand bell. Rental Item. $5.50 each. #B5195. 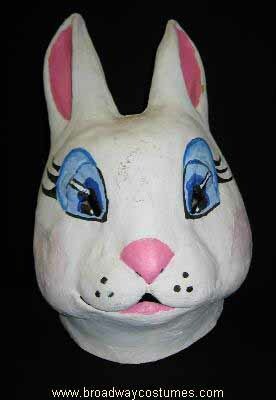 Sleigh bells. Rental Item. $6.50 each. #G5050. Glasses. Rental Item. $7.50 per pair. #B5180. Riding boots. Rental Item. $21.50 per pair. #P5070. Padding. Rental Item. $14.50 each. #W6380. Synthetic hair wig and beard set. Rental Item. $46.50 set. #W6382. Synthetic hair wig. Rental Item. $23.50 each. #W6384. Synthetic hair beard. Rental Item. $23.50 each. #C0812. Hooded, knee-length, gold trimmed, red velvet tunic with white faux fur trim; matching red velvet breeches; brown belt; brown boot tops; synthetic hair wig and beard set. Rental Item. $99.50 each. #C0838. 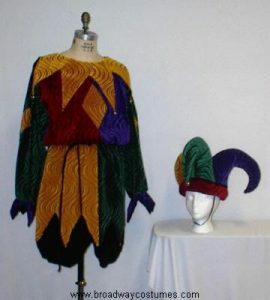 Peaked red elf hat; bright green or white blouse sleeved shirt; red bolero-cut vest with gold trim; green knee breeches; red and white striped hose, solid hose or tights; waist sash and shoe buckles. Rental Item. $54.50 each. #C0840. Red and/or green hat or cap; green tunic (some with separate collar); belt or sash; tights; ballet slippers. Rental Item. $54.50 each. #C0860. Mob cap; bow, cameo or holly (at neck); Gibson blouse; long red skirt; shawl; sash. Rental Item. $54.50 each. #C0870. In red velvet. Mob cap; bow, cameo or holly at neck; white high necked blouse; long red velvet skirt; petticoat; short velvet cape; sash. Rental Item. $84.50 each. #C0872. Dark red velvet dress with gold trim and faux fur trim; white apron; mob cap; petticoat; shawl. Rental Item. $84.50 each. #C0880. Hat; one- or two-piece sleeved or sleeveless mini-length dress; belt; hose or tights. Rental Item. $54.50 each. #C0890. In red lamé with poinsettia appliqués. V-necked mini-dress with white faux fur trim; matching hat, neck choker and belt; dance trunks. Rental Item. $64.50 each. #C0920. Large snowman’s head; white body suit. Rental Item. $99.50 each. Please note that photo shows head only. #C0921. 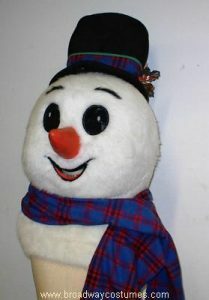 Full, oversized, hard, faux fur covered head with carrot nose; foam top hat; one-piece, faux fur, padded body suit; black vinyl boot tops; winter scarf; gloves. Rental Item. $120.50 each. Please note that photo shows head only. #C0825. Long green pile faux fur, open faced hood; matching trousers; matching, elongated fingered gloves; older-style plush red Santa hat and coat; black belt. Rental Item. $64.50 each. #H2380. High hat; tail coat; vest; trousers; high collared shirt; cravat; scarf; gloves; cape. Rental Item. $140.50 each. #H2382. 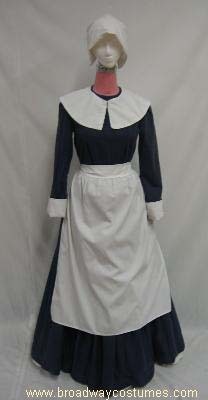 Bonnet; cape or capelet; one- or two-piece dress; reticule; full or hooped petticoat; gloves; cameo. Rental Item. $140.50 each. #H2384. Soft cap; jacket; shirt; Byron tie; breeches or trousers; hose; scarf. Rental Item. $54.50 each. #H2386. Bonnet or mob cap; capelet; blouse with bow; skirt. Rental Item. $64.50 each. #A2320. One-person. Head; body; mitts; shoe covers. $99.50 each. Please note that photo shows head only. #A2360. 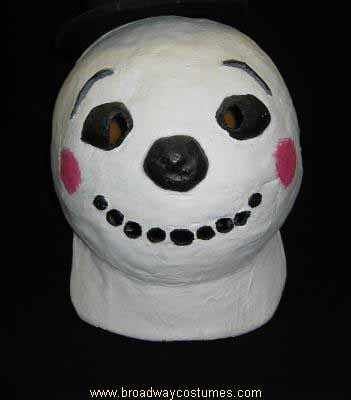 One-person with red nose. 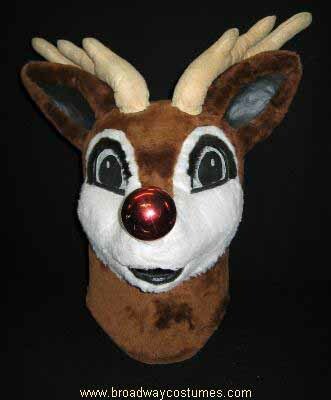 Full, oversized, hard head with red nose; body suit; paws. $99.50 each. Please note that photo shows head only. #A2340. Two-person. Head; blanket body with built-in shoe covers; mitts; suspenders. Rental Item. $120.50 each. #A2355. Christmas parade band leader. Oversized faux fur covered head with red sequin busby; red tail coat; wing collared shirt; bow tie; vest; white trousers with stripe; oversized red boots; white gloves. Rental Item. $99.50 each. Please note that photo shows head only. #W0280. Shako; red uniform jacket with metal buttons; red uniform trousers; white cross belts; white gloves; boot tops. Rental Item. $84.50 each. #E5025. Fringed epaulets. Rental Item. $13.50 each.